Is Sigfox/LoRa the new WiMAX? Do you remember back in 2007 when there was a hot debate about which mobile broadband technology would succeed? * HSDPA had already been deployed and HSPA (HPUPA and HSDPA) was just on the starting blocks, but it was not really seen as being powerful enough for the expected capacity and performance needs in mobile broadband. WiMAX on the other hand, had a good opportunity to make the transition to mobile communications. It came out favorably in studies that analyzed the pros and cons of the competing technologies and had major support from the WIMAX Forum, with over 400 members (including Nokia/NSN) creating a strong internet-centric and device-focused ecosystem. 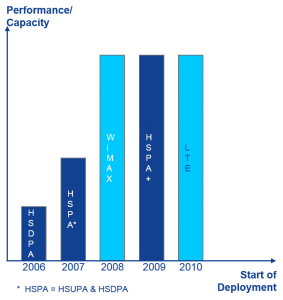 Additionally, it was perceived that WiMAX had a strong timing advantage over HSPA+ or LTE. We now see a similar discussion happening around Sigfox, LoRa and other alternative Low-Power Wide-Area (LPWA) access technologies for the Internet of Things (IoT). The availability of 3GPP Rel. 12 Cat.0 technology with power saving mode is a big step forward, but it is probably comparable to the position of HSPA back in 2007. The key step will be the availability of 3GPP Rel. 13 technologies like LTE for machine-to-machine communications (LTE-M) or Narrow-Band LTE (NB-LTE), but as before, one of the hottest discussion topics we see in the market is the timing, since it will be ready for deployment about a year later than Sigfox or LoRa. Let's go back to the mobile broadband technologies. As we all know, HSPA+ and LTE now dominate the market with more than 400 networks each in commercial operation worldwide and today, WiMAX remains a niche technology. Factors other than initial availability, such as a proper evolution path for existing 3G networks or licensed spectrum availability, were more important in deciding the outcome. The decisive aspect was proper interworking with existing 2G/3G networks including support for roaming and pre-paid billing. WiMAX started as a fixed-wireless internet technology and it took time to provide the functionality that was expected by mobile users, and thus the initial time-to-market advantage was negated. For IoT connectivity, we foresee a similar evolution. Early-birds are great to stimulate the ecosystem and drive competition, however in the long run, it looks like the 3GPP evolutionary path for existing mobile networks will win the race once the 3GPP Rel. 13 standardization process is completed. Whether NB-LTE or LTE-M, it seems that enabling LPWA services with full interworking to existing cellular networks and services while providing even better network coverage at lowest infrastructure investment risk would be the best combination for long-term success. Share your thoughts on this topic by replying below – or join the Twitter discussion with @nokianetworks using #NetworksPerform #mobilebroadband #IoT #LTE-m #NB-LTE. Stefan is Head of Technology Marketing, responsible for positioning the latest key technology areas including telco cloud and Internet of Things (IoT). Having held several positions in sales, marketing, and business lines in the ICT industry for 20+ years, Stefan has extensive knowledge of fixed and mobile networks as well as management systems.